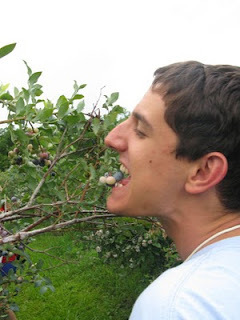 June 6, 2010 - Kristina, Josh, and I headed out to Earlton, Florida to go blueberry picking! If you are looking for something different to do...you should definitely find a blueberry farm close to you! They gave us a small bucket to hang around our neck, a larger bucket to put all of our blueberries in, and then let us venture out to pick as many blueberries as our hearts desired. It started pouring rain in the middle of our picking, but we had drove all the way out there...so we just kept picking. We were soaked by the end, but it was worth it. The blueberries are amazingly delicious! 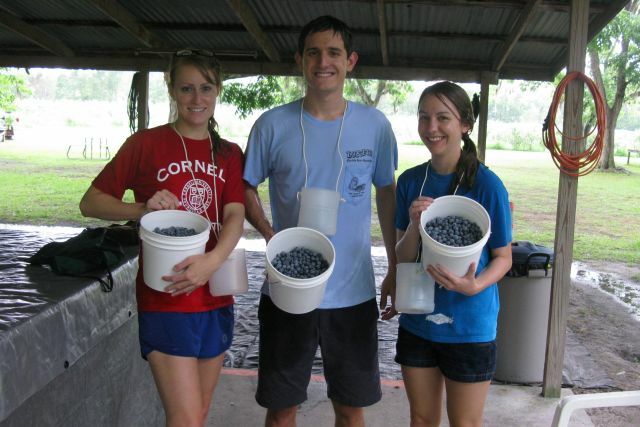 We picked over 12 pounds of blueberries! Blueberries are $2.50 a pound.